First established in 1949, the Galvanizers Association is the representative body for the galvanizing industry in the UK and ROI, and Tuesday 12th September marked their Industry Open Day. In total, 34 sites opened their doors to guests, with the hope of providing attendees with a deeper understanding of the galvanizing process. METaL team members Eleanor Hubble, Phil Barnes and Lee Bridgeman, took up the offer of a RIBA Approved Plant Tour and travelled to Joseph Ash Galvanizers Ltd in Bridgend, and Cardiff Galvanizers Holdings (1969) Ltd. The tours of both organisations provided a fascinating insight into the hands-on process of hot-dip galvanizing, a method which has not changed in over a century. In fact, the first recorded mention of this procedure was in France in 1742, and later in England in 1837. On our respective tours, we were taken through the various galvanizing stages. 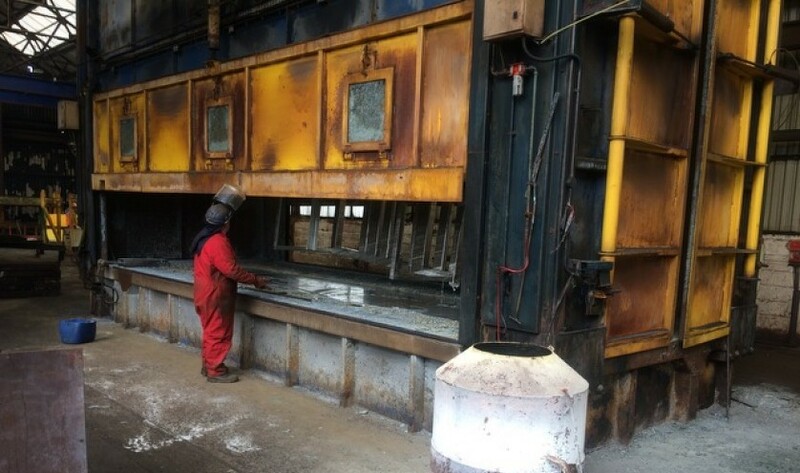 For the hot-dip galvanizing reaction to take place, the surface of the object in question must be chemically clean and free of dirt, rust, grease and scale. Degreasing occurs first, most often by dipping the item into a hot alkali solution. In extreme cases, abrasive blasting can also be used to ensure the cleanliness of the item. Following a rinse in cold water, the item is then submerged in the Pickling Acid Baths. By dipping the product into a deep bath of room temperature Hydrochloric Acid (HCl), any mill scale (the flaky surface of hot rolled steel) should be removed. The acid is not agitated in any way, the desired effect is achieved through total submergence into the bath. After a further rinse to remove any H.C.L residue, the product is then placed into a bath of flux solution - 30% zinc ammonium chloride plus wetting agent, which is kept at 65-80 degrees Celsius. The purpose of the flux solution is to remove any film on the surface of the steel, preventing oxidization prior to galvanizing. Finally, after this lengthy preparation process, the item should be ready to be galvanized. It is dipped into a bath of molten zinc, kept at a constant temperature of between 440-460 degrees Celsius. This procedure incurs a reaction between the zinc and the steel component, resulting in a full metallurgical bonded coating on the product. The reaction is clearly visible, with the zinc bubbling up on contact with the item; typically, this process will take around five minutes to complete. Lastly, the product is cooled by water-quenching, where it is doused with a solution of potassium dichromate. In some cases, the item can be cooled by air-quenching, however, due to the highly reactive surface of the zinc, contact with moist air can lead to oxidisation and potentially corrosion. It would seem that nothing is wasted during galvanization, any zinc which can be recovered is re-used, and even the fine ash or dross (zinc and iron accumulated at the bottom of the baths) become zinc dust, for use in cosmetics, rubber additives and electronic components. Hot-dip galvanizing is used on a vast range of steel products, including, but not limited to, fencing, staircases, green-house frames, CCTV poles, even artistic sculptures, and once you know what to look out for, it's hard not to notice galvanized steel everywhere. The METaL team would like to extend their thanks to both Joseph Ash Galvanizers Ltd in Bridgend, and Cardiff Galvanizers Holdings Ltd for providing such an informative tour.